Prior to joining Falcon Structures, much of my career experience focused on high tech, specifically, software development. In the high-tech world, the phrase “Eating your own dog food” commonly refers to a business using the same software or technology it develops for its customers. There’s goodness in that approach. If you aren’t willing to use your own software, you probably shouldn’t be selling it to your customers. At Falcon Structures, we eat our own dog food. 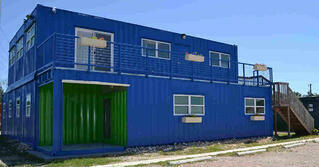 All of the offices on our site are built out of shipping containers. I wasn’t sure what to expect when I started working at Falcon earlier this year. Many of our customers use modified shipping containers for temporary offices at construction sites and other industrial applications. The inherent durability and mobility benefits of a container-based office are obvious to even the most casual observer. Yet I wondered, could a shipping container office provide a sustainably positive experience over the long-term? Initially, I assumed that working in a container-based office would almost feel like camping out. I grew up in Northern Michigan in the early 1970s, a simpler time absent of the temptations of cable television and video games. We played outside every day, and my friends and I built many tree forts in the woods. The fact that I’m still alive today is a testament more to luck than to good structural engineering practices. So I asked myself, would working in a container-based office take me back to those days when we spent countless hours hanging out in tree forts? Maybe a little (or a lot) rickety and possibly not so watertight? 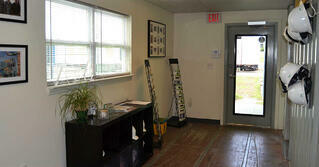 Alas, my new modified shipping container office didn’t take me back to the days of my youth. In fact, I realized that working in a container-based office is pretty much the same as working in a regular office. At Falcon, our multi-level main office includes five container offices on the first floor and three on the second floor. Our Manor, Texas headquarters also houses two additional triple-container offices onsite, separated by a courtyard with picnic tables for staff breaks and meetings. I work on the second floor of the main office, and I’m happy to report that I have never felt the floor sag, and it doesn’t feel bouncy. Even better, the rain stays out and the climate control system keeps me cool on hot days and warm when the temperatures drop. So I’m convinced, working in a connex shipping container office is the same as working in a regular office, because, quite simply, it is a regular office. 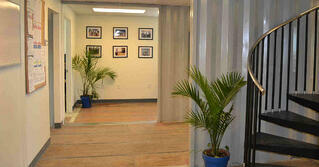 Falcon’s container offices include windows, personnel doors, office-grade finishes, and electrical. We even have fully operational restrooms. I’m an electrical engineer, not a structural engineer, but I know the reason I’ve had such a great initial experience working in a containerized office is due to the Falcon difference. 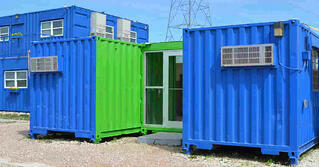 Along with many comfort-based amenities, Falcon container structures have been engineered for safety and durability. We construct all of our shipping container office products using certfied welders and field tested manufacturing processes. If you need a rapidly deployable, durable office that can withstand the harshest environments, I can tell you that containers meet those needs and more. On the other hand, if you’re looking to relive the days of tree forts in the woods, you should probably grab some two-by-fours and plywood and go for it. I’m proud to say that Falcon eats its own dog food, and it tastes pretty good!